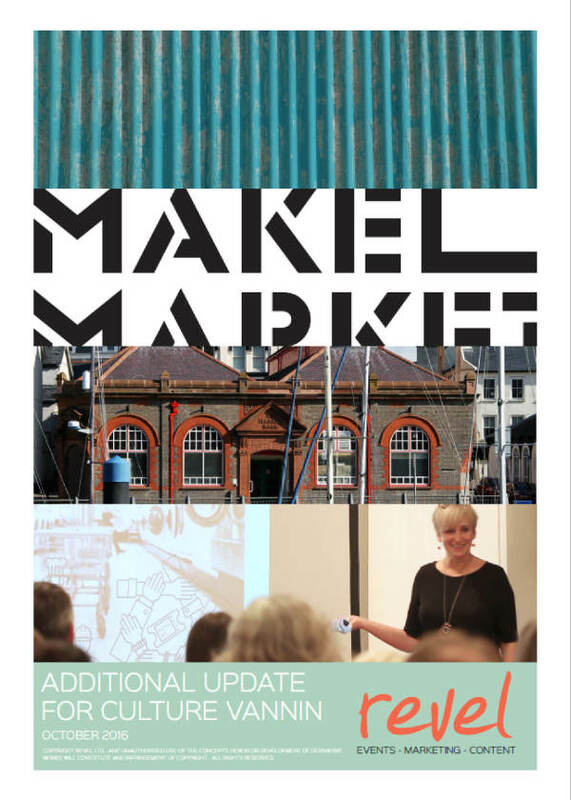 MakeMarket: A Creative Industries Takeover launched in summer 2016 with a diverse programme comprising 50 public events in Douglas Market Hall. The aim was to raise awareness of the Islandâs creative industries and highlight the economic opportunities offered by them, whilst also demonstrating potential for shared use of creative space in an existing building. The concept was developed as a partnership between Helen Fox (University College Isle of Man) and Kate Brier and Sam Jones (Revel). The level of engagement, both within the creative industries and wider general public, has been notable, during and post project. Events were well-attended, support from media significant, digital reach wide and the MakeMarket brand now recognised. This in mind, the MakeMarket team is considering different options to host future events and initiatives. Culture Vannin specified an interest in supporting events focussed on architecture, fashion and film. This in mind, steps were taken to incorporate each of these industries as themes or highlights of the programme.